A family participates in STAR's Family & Friends Golf Tournament last year. This year's tournament will take place Sept. 15. 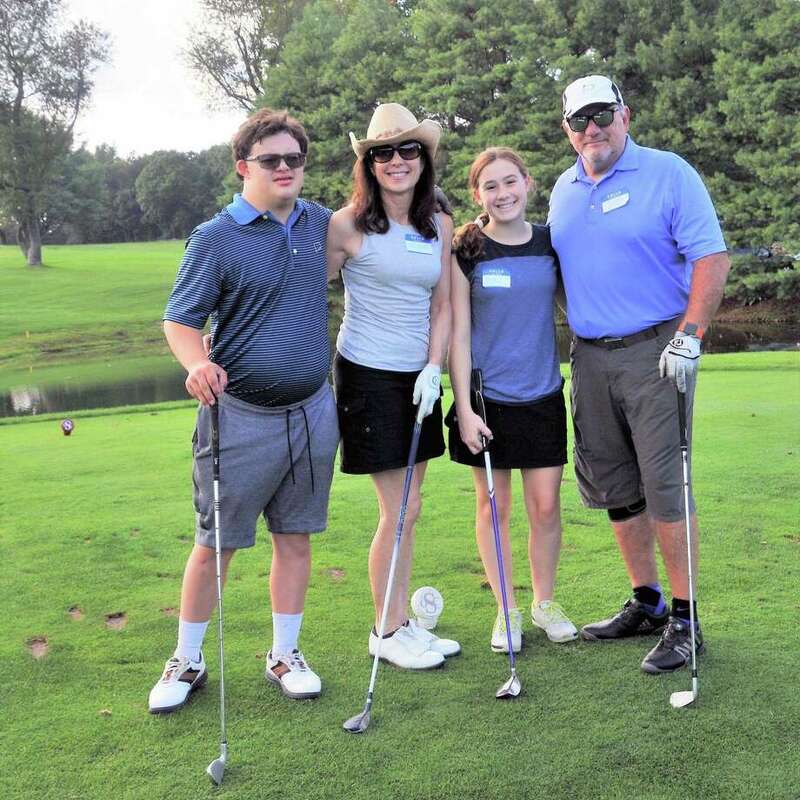 STAR’s second annual Family & Friends Golf Tournament will be a nine-hole, best ball scramble with a shotgun start on Sept. 15 at the Silvermine Golf Club, 95 North Seir Hill Road, Norwalk. “We were very excited last year to have a sell-out crowd of golfers who were joined by an equal number of family members and friends for the barbecue. The setting at Silvermine in September is idyllic and we are very grateful to the golf club staff for their gracious hosting of our fundraiser,” STAR Executive Director Katie Banzhaf said. Tickets to golf are $150, $500 for a group of four and $125 for youth under 18. Family members/non-players can attend the barbecue buffet for $40, $90 for families of three or more. Proceeds benefit STAR, Inc., Lighting the Way’s programs and services for infants, children and adults affected by intellectual and developmental disabilities in Darien, New Canaan, Norwalk, Weston, Westport, Wilton and Stamford. The Kershner Gallery hosts a reception on Saturday from 4:30 to 6:30 p.m. for “Reconstructions,” the paintings of Karen Neems, Cherril Kolesik and Philip Eras. The artists will talk about their work at 5:15 p.m. The paintings will be on display until Sept. 15 at the Fairfield Public Library, 1080 Old Post Road. Eras began art lessons in 1963 while he was a medical officer. When he retired in 1999 from being a physician, he became a serious painter. Having taken art classes at various times, he studied with a professional artist and later had the first painting he did with her selected for the cover of Connecticut Medicine. Another painting was featured in an AMA journal. Eras has shown his paintings in area venues, including the Westport Fine Arts show, and in Florida. Neems is an award-winning photo collage and mixed media artist based in Stamford. She studies at Silvermine Arts Center and with artist mentors. She has had many solo and group shows at area galleries and museums and won awards for her work in photography and mixed media. Her work is in both private and corporate collections. Kolesik received art training at Silvermine as a child and later. She studied art education at Georgian Court University in Lakewood, N.J., and studied interior design at Fairfield University. A class in decorative painting led her to form her own business, which continued for 23 years. The new Westport/Weston Hebrew after-school program has opened its registration for classes in September. Freida Hecht is the director of the program. The Jewish culture enrichment program will feature the Aleph Champ Hebrew reading and writing program and a hands-on learning approach, with children learning about Jewish history, traditions, holidays, Israel and more through games, drama, arts and crafts and baking. The school offers innovative bar/bat mitzvah preparation and celebrations. New for this year is the B’nai Mitzvah Division for sixth- and seventh-grade students preparing for their bar or bat mitzvahs, which will include a Jewish discovery course, social action opportunities and “Stump the Rabbi” discussions. Jeremy Staffa, of Westport, was named to the spring semester dean’s list at the University of Rochester. The following Westport residents were named to the spring semester dean’s list at Loyola University Maryland: Lily Dane, Lucas Jackson, Edward Long, Michael Meszaros and Michaela Troiani. Madeline Mann, of Westport, graduated from the University of Alabama with a bachelor’s degree in education in May.